LeBron James the man has been dissected like a frog in a high-school science lab ever since the summer of 2010. Turncoat. Diva. Frontrunner. I've written mean things about James and have thought worse. Think an icy road, a steep incline and a cement truck with faulty brakes. To me he was a soulless scumbucket with all the cultural awareness and dignity of a toaster oven. Now, The Letter Part 2 has arrived, an old-school lightning bolt from above that has come without fanfare, Decisions, or pro wrestling-style player intros. James's "essay," published on Sports Illustrated's website today, ushers in a new era of Cavs basketball, and, on a much larger scale, serves as an enormous boost for the city of Cleveland in too many ways to count. Stunned is the operative word right now. Not elated, just a feeling of fullness and possibility, for both the team and for Northeast Ohio. James is the best basketball player on the planet, but much more importantly he can also stand as a symbol for prosperity and change. Maybe the guy many thought was a heartless mercenary has grown up. And maybe the city he's coming back to will continue to evolve right along with him. 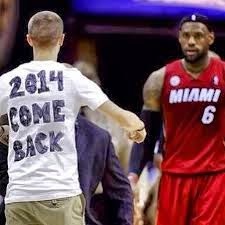 LeBron Watch 2014: Are we having fun yet?